MILLIONS of people throughout the world have taken to the streets to condemn the American attack on Syria last weekend and show their support for Bashar al Assad’s popular front government in Damascus. No one was killed in the imperialist raids, but a number of troops and civilians were injured. Britain and France launched missile attacks on targets in Damascus and the central province of Homs to retaliate for the Syrian army’s alleged use of chemical weapons in Douma on 7th April. The Syrian Arab Army said their air defence system had intercepted most of the missiles and vowed to continue fighting the foreign-backed terrorism in Syria. THERESA MAY the Prime Minister and Home Secretary Amber Rudd have been forced to apologise in Parliament over the callous and racist treatment of up to 50,000 people who came to Britain from the West Indies between 1948 and 1971 at the invitation of the British government and settled here. They are now being told they need documentary proof that they are not illegal immigrants or they face deportation. Most of these people were children when they arrived and were included in their parents’ passports. Since then many of them have never sought a passport of their own. They came here before the West Indies were granted independence, as British subjects entitled to live anywhere in the Commonwealth, to help rebuild Britain after the Second World War. Over the years they have played a major role in staffing the NHS and keeping public transport running in major cities. 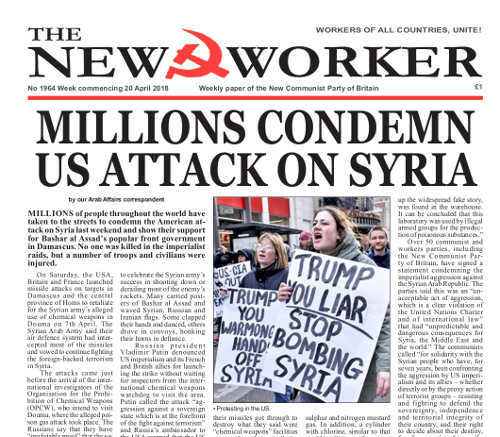 WHILST THE chief American war-lord Donald Trump brags about his “perfectly executed strike”, millions of people all over the world have taken to the streets to condemn American and Anglo-French imperialism following the missile attacks on Syria last weekend. Thankfully no-one was killed by the imperialist missiles, although this was largely due to the competence of Syria’s air-defences that downed 71 of the 103 missiles before they hit their targets. When Trump was running for the presidency he posed as a ‘non-interventionist’ opposed to confrontation with Russia and ‘regime change’ in Syria. Once in the Oval Office these promises were swiftly forgotten, along with all the others apart from more tax breaks for the rich, as Trump moved on to do the bidding of the most reactionary and aggressive sections of the US ruling class who had put him into the White House in the first place.